I recently received an email from Linc's (also known as Lincoln) owner Sharon. On December 12, 2008, Linc was sent to Rainbow Bridge due to Degenerative Disc Disease (DDD). He will be missed very much by the entire Tokarchuk family as well as myself. Linc was out of my first homebred litter and was my first Canadian Champion but most importantly, he was a huge part of Sharon and Jeff's family. The road to obtaining Lincoln's Canadian Champion title was a wonderful ride that I was able to share with the Tokarchuk's and I will always be grateful for the wonderful home they gave Linc. God speed beautiful, sweet boy! Linc is now retired from the show ring and is enjoying life with his owners, Jeff & Sharon Tokarchuk, in Calgary, Alberta, Canada. Co-owned with Sharon & Jeff Tokarchuk while he was shown, Linc is the first homebred champion for CynTech Boxers Perm. Reg'd and is the 1st Canadian Champion for Malimi's New Debut For CynTech CD, ASCA CD (Kahlua) (Am/Can. Ch. Ajay's Alfred Sung SOM X Can. Ch. Malimi's Sugar Plum DOM) from her first litter and he is the 5th Canadian Champion for his sire, Can. Ch. Berlane's Corporate Image (Max) (Multi BIS & BISS Am. Ch. Rochil's Grande Marshall SOM X Can. Ch. Rayshar's Summer Magic CD TT). Linc got a good start to his show career by going Best Puppy In Breed, in his second weekend of showing, at the Alberta Kennel Club show on February 6, 1999, under US judge, Patricia Gellerman. In his fifth weekend of showing at the Red Deer & District Kennel Club show on April 3, 1999, Linc repeated with another Best Puppy In Breed under Canadian judge Phyllis Wolfish. At the Hub City Kennel Clubs shows in Saskatoon, Saskatchewan, on April 30, 1999, and May 1 & 2, 1999, Linc obtains his first five points in his quest for his Canadian Championship! The first day, April 30, 1999, Linc went Winners Male for 1 point under Australian judge John W. Thompson. 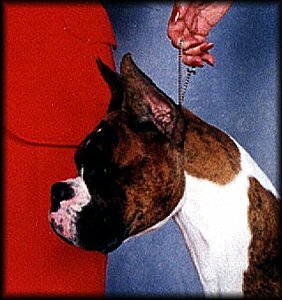 The following day, May 1, 1999, under Boxer Breeder judge Eve Whitmore, Linc went Winners Male, Best Of Winners for 3 points and on the last day, May 2, 1999, under Canadian judge Ingeborg James, he went Winners Male for 1 point..
At the Saamis Kennel & Obedience Club show in Medicine Hat, Alberta, on May 15, 1999, Linc went Winners Male, Best Of Winners for 2 more points under US judge Helen Miller Fischer. In his final weekend of showing, at the Northland Kennel Club shows in Fort McMurray, Alberta, Linc went Winners Male, Best Of Winners for 2 points under Canadian judge Kathleen Guimond on May 23, 1999, and on May 24, 1999, he went Winners Male, Best Of Winners for 1 point under Canadian judge Helen M. Hobbs, which made him a Canadian Champion! Linc was expertly handled by Lori-Ann Fischer from start to finish. Thank you Lori-Ann! I cannot express in words, how producing my first homebred champion makes me feel and what it means to me! I can tell you that I will never forget it!